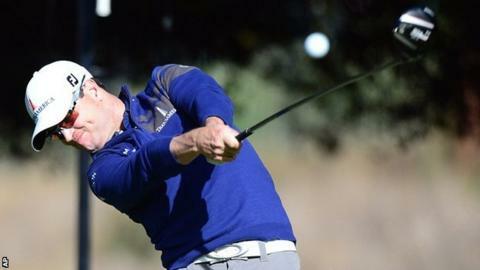 Zach Johnson beat world number one Tiger Woods in a play-off to win the World Challenge in California. In a remarkable conclusion, Johnson found water with his approach at the 18th before holing from the drop zone. Playing partner Woods then put his bunker escape to within four feet and made par to force a play-off. At the first extra hole, again the 18th, Woods found sand once more with his approach and missed a par putt from five feet to hand Johnson victory. Woods was the tournament host at Sherwood Country Club and aiming to win his sixth tournament of the year, although this was not an official PGA Tour event. Northern Ireland's Graeme McDowell, a two-time winner of the competition, was highest-placed European on five under in the 18-man event. Woods and Johnson, the world number 16, finished the regulation 72 holes on 13 under par. Woods carded a final-round 70 while Johnson fired four birdies in his last eight holes for a closing 68. "You want to end the tournament with someone making a putt," Johnson said after the miss from Woods handed him his second tournament victory of the year. "You don't want to see it like that, especially when he has hit a really good sand shot. 264 events, 10 wins, 214 cuts made, 8 second places, 8 third places, 52 top 10s. "He played great, he didn't make as many putts as I did. That's all it really was. "Everybody talks about going head to head with him. That's what I want as a competitor, I want to play against the best. He's the best I've ever played with, and I want to put myself in that position. "I just like to compete and being in those situations where you get into holes you have to execute, you have to hit a shot. I feel very honoured to be the champion." For Woods, it was only the fourth time in his career that he lost a lead of at least two shots going into the final round and the second time at Sherwood, following McDowell's victory in a play-off having been four shots behind in 2010. But reflecting on 2013 he said: "Five wins, and you know, on some pretty good venues, so I'm very pleased with the year." Woods won the most recent of his 14 majors in 2008 but is confident about next year's venues. He has won at Augusta, the permanent home of the Masters, four times, finished second and third in the last two US Opens staged at Pinehurst and has previously won at both Hoylake - venue for next year's Open Championship - and Valhalla, which will host the PGA Championship in August. "I've won at every one, except for Pinehurst, and I'm trending in the right way," the 37-year-old said. "I've finished third, second. You get the picture, right? "So I'm looking forward to the major championship venues next year. They have set up well for me over the years and I look forward to it."